This is especially true when the FOMC changes its policy stance because the market expectations will also adjust, and more uncertainties will emerge. What is happening with world gold reserves? It is not clear whether by choice or by chance, the Bank of International Settlements in Basel, Switzerland, called the "central bank of central banks," for its key role in the world financial system, has set an appointment with the story for March 29: Resurrection of the gold standard in the banking world. The Sun / 24 Hours has discovered that among the complex but well-known reforms of the standards for credit and finance from the "Basel 3" plan, there is an accounting alchemy that can turn gold into money on the balance sheets of the large banking groups. From March 29, by decision of the BIS, the gold in the portfolio of commercial and business banks becomes "cash equivalent," an asset equivalent to cash and therefore "risk-free." In fact, it is the first "reassuring of gold" since the time of the Bretton Woods agreement. Technicians call it "gold remonetization," a process that is the reverse of the "demonetization" of gold decided by Nixon. The operation of the BIS, as reconstructed by The Sun / 24 Hours, carries the signature of the Federal Reserve, the European Central Bank, the Bundesbank, the Bank of England, and the Bank of France, the G-5 of the great global monetary powers. In 2016, when the new rules of the banking system included in the "Basel 3" package were defined, the central bankers committee inserted an epoch-making norm that no one, however, has ever openly discussed in public. In practice, gold in "physical" bullion -- hence not under the "synthetic" form of certificates -- will return to be considered by regulators as the equivalent of the dollar and the euro in asset security, thus eliminating the obligation to weigh the risk for the purpose of capital absorption, as with any other financial asset, excluding (for now) eurozone government bonds. The turning point is not insignificant for the gold market and for the very role of national gold reserves. The result is significant: With the new rules of Basel 3, gold is given the same status that is now recognized for sovereign bonds on bank balance sheets. A question therefore arises: Is the promotion of gold the premise for applying a weighting of risk to the government securities held by banks? From the debt crisis, the regulators' objective was in fact two-fold: to require the banking system to hold an adequate equity to cover the risks. In the crosshairs there are mainly the government securities that according to current rules can be held by banks without any impact on their assets. The issue mainly concerns low-rated countries such as Italy, Spain, Portugal, and Greece, which were seen to be special after the debt crisis in 2011. The banks of these countries, both to increase profitability (carry trade) and to facilitate the issue of public debt in auctions, have the highest amount of government securities in the euro area. And this phenomenon is particularly felt in Italy, where the banking system has 400 billion BTp on the 2.4 trillion of public debt. What would happen then, if it were applied to risk weighting on Italian government bonds as the Basel committee wants? The consequences depend on the level of risk weighting applied to the Italian government bonds. If it were high, some banks could be forced to replace the securities with other financial assets, including gold, or to proceed with capital increases. At a time when the market is reluctant to buy bank shares, the risk of repercussions on the stability of the banking system could be high. Just look at the credit default swaps (default risk insurance) on Italian banks. According to Bloomberg data, the five-year credit-default swaps of some of the major Italian banks have surged since the spring of 2018, even tripling the value in some cases. It is in this context that the date of March 29 is approaching rapidly. Countries that have repatriated gold from abroad, regaining control and management, are already protected from the risk of being short of physical gold after March 29 to make available to their banks in case they want to replace sovereign bonds with it. In the arsenal of the system, there is a golden mountain of 33,000 metric tons of gold worth $1,400 billion at the current exchange rate. And that represents 20 percent of all the gold extracted in the world in almost 3,000 years. As usual, the most forward-looking and prudent countries -- or perhaps the best-informed about the turnaround coming at the end of March -- were Germany, Holland, Austria, France, Switzerland, and Belgium. But Poland, Romania, and Hungary also regained control of gold reserves, increasing their consistency. China, Russia, India and Turkey have been the nations that have bought gold in the last two years more than anyone else, with Moscow having even liquidated its entire portfolio in U.S. government bonds to replace them with precious metal. But the problem is not this; it is the price of gold. In 2018 as many as 641 tons of gold bars were bought by the monetary authorities of every continent, but above all in Europe, it is the highest level since 1971. The maneuver is unprecedented and should be seen in the phenomenon of repatriation of ingots of state custody. Seven thousand tons of gold reserves were withdrawn by central banks from the coffers of the Federal Reserve Bank of New York, while 400 tons were secretly released by the Bank of England. In recent years, but especially in 2018, a jump in the price of gold would have been the normal order of things. On the contrary, gold closed last year with a 7-percent downturn and a negative financial return. How do you explain this? While the central banks raided "real" gold bars behind the scenes, they pushed and coordinated the offer of hundreds of tons of "synthetic gold" on the London and New York exchanges, where 90 percent of the trading of metals takes place. The excess supply of gold derivatives obviously served to knock down the price of gold, forcing investors to liquidate positions to limit large losses accumulated on futures. Thus, the more gold futures prices fell, the more investors sold "synthetic gold," triggering bearish spirals exploited by central banks to buy physical gold at ever-lower prices. With this system, those looking at gold as a safe haven, like China, India, Russia, and Turkey, have practically doubled their gold reserves in the last five years. Moscow, to buy gold, has even sold the last 20 percent of the U.S. government bonds it held in currency reserves. How compatible is such a situation with the duties of correctness and transparency of a central bank? Certainly, the system created by the Anglo-American "Goldfinger" seems to be made for abuses. Who knows what will happen after March 29? 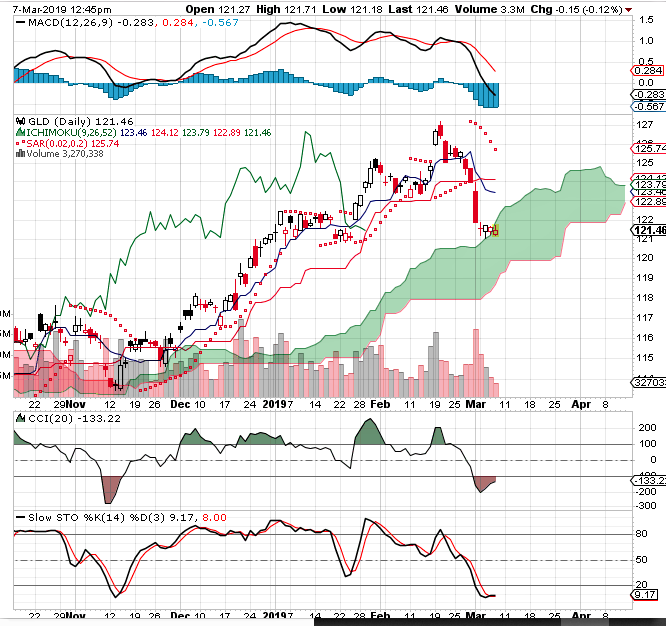 Daily clouds on GLD look interesting. A lot of indicators looking very weak so a good buy here. We are in the cloud and as long as in or above, the uptrend is in place. The Financial Post reports in its Thursday edition that Barrick Gold's sudden expansionist desires are driven by the same concerns as the rest of the industry -- it is getting harder to find gold and more expensive to mine it. The Post's Gabriel Friedman writes that is the view of John McCluskey, chief executive officer of Alamos Gold. Barrick is pursuing a $17.8-billion (U.S.) hostile bid for Newmont Mining in a deal that would combine the two largest gold companies into a firm of unparalleled size. Mr. McCluskey said he thinks that Barrick, and its new chief executive officer Mark Bristow, are concerned about the company's gold reserves and wants to increase its size so that it can comfortably sell off less-impressive mines without cutting its profitability. "They're trying to essentially get enough critical mass so they can afford to divest what they know in their portfolio are non-core assets," said Mr. McCluskey. "It doesn't help Mark Bristow's case when he describes those non-core assets as second-tier or garbage because then the companies he's hoping will buy those, they have to turn around to their investors and explain why they want to buy garbage," he said, adding that he admires the Barrick CEO. If legislators enact the bill, Manly writes, "Romania looks set to join the ranks of Hungary, Austria, Germany, and the Netherlands in bringing gold bars back into domestic storage. Which European nation will be next after Romania? Poland is a likely candidate, with 102.9 tonnes of gold stored at the Bank of England." ROME -- Matteo Salvini has raised the possibility of wresting control of Italy's sizeable gold reserves away from the country's central bank in the latest in a series of threats to the independence of the Bank of Italy by Rome's populist coalition. "The gold is the property of the Italian people, not of anyone else," Mr Salvini, deputy prime minister and leader of the League party, said in comments to reporters today. According to a new report by the World Gold Council, holdings in global gold-backed ETFs rose 72 tonnes in January to reach 2,513 tonnes (80.8m troy ounces), hitting the highest levels in nearly six years. In dollar terms net inflows in January equaled $3.1B with the value of gold held in ETF vaults reaching just shy of $107B by the end of the month, a 6% increase. January was the fourth consecutive month of net inflows, according to WGC data and thanks to a blockbuster December 2018, 185 tonnes or $8B was injected into the scores of funds listed around the world over the past four months.